A new free service to help vulnerable people stay at home and reduce hospital presentations with responsive care. Enrolled people are phoned one to three times each week to see if there are any concerns which, if ‘red flagged’, are referred on to a Registered Nurse who phones or visits the person to determine what immediate care is required. Healthy@Home is for anyone over 18 years of age with various conditions that render them vulnerable and at risk of hospitalisation. GPs, friends and family can phone Healthy@Home on 5352 9328 to discuss the service. 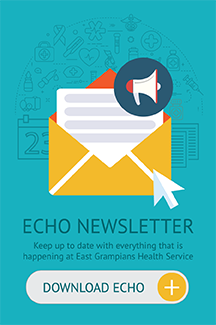 EGHS employees can simply fill out a Healthy@Home screening tool and return it to Community Nursing, via fax 5352 9425. An appointment in the person’s home will then be set up with them and their carer as applicable. This service does not replace GP visits or an ambulance in an emergency situation and is only available during normal office hours.